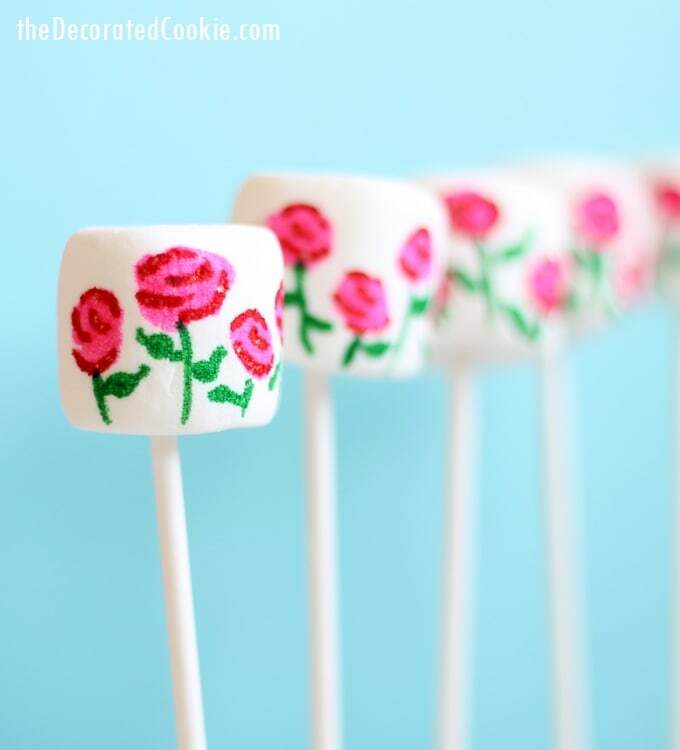 Rose garden marshmallows are so easy to make and give for Valentine’s Day. 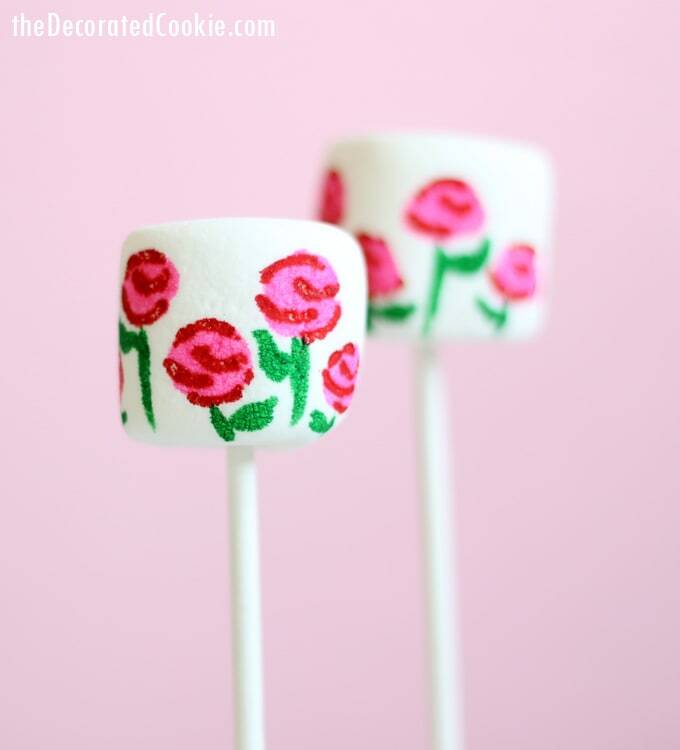 “EASY” is in all-caps to truly impress upon you how very super duper easy these rose garden marshmallows are to make. 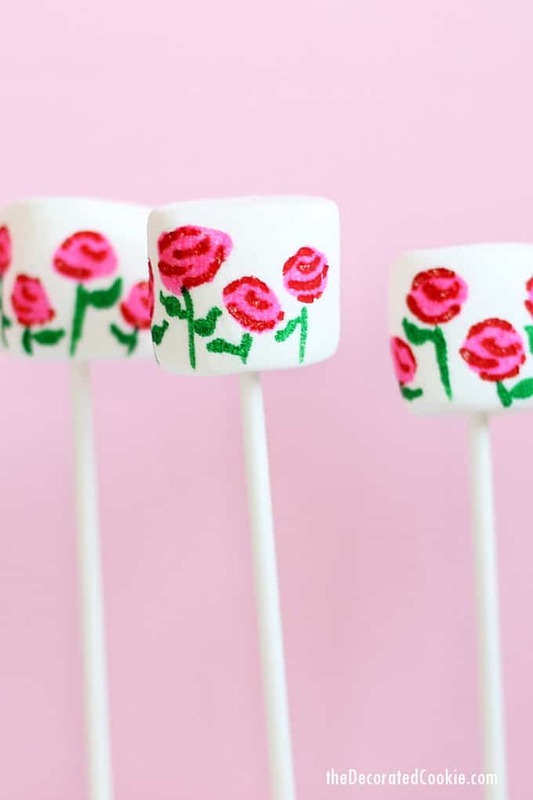 Marshmallows, lollipop sticks and a few edible writers and you’re on your way to a cute Valentine’s Day treat. If you can draw a dot and some lines, you can draw these. And they are so very simple and pretty. The edible writers I used here are two different brands. 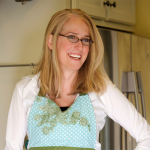 The pink and green are Americolor Gourmet Writers and the red is a fine line Foodoodler. I like the fine line for the detail. 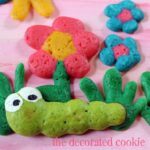 But unless you already own two different brands, you can draw these with any edible writers, including those found at the craft store. 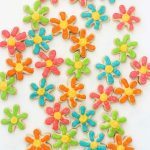 So don’t feel you need to spend a fortune on edible writers. One pack is just fine. If the writer is a little thick, just press lightly when you do the details, and use only the tip. This 40-second video gives you the step-by-step how-tos, but I’ve also included them below if you’d like to go the old-fashioned route. 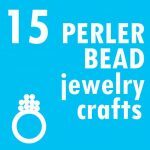 At the end of this post, you’ll find links to supplies. 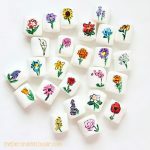 And don’t forget to check out my post all about edible writers if you want to learn more about this magical decorating tool. And now, here’s the non-video version. 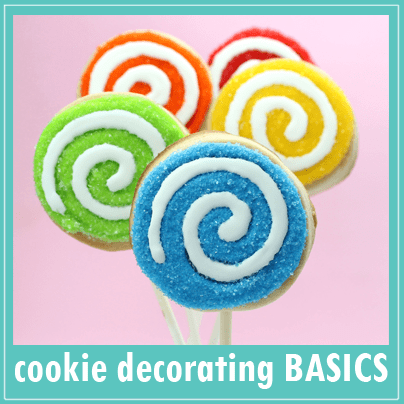 *Find lollipop sticks and edible writers at the craft store. The craft store will likely have the Wilton brand. Shown here are the Americolor Gourmet Writers (green and pink) and the red fine-line Foodoodler, both of which are available online. See below for more information. 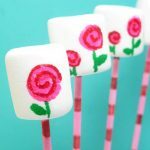 Skewer marshmallows with lollipop sticks. To draw the roses: First, draw pink circles. Then, draw 3 or 4 thin, curved lines in red on top of the pink circles. Use the green writer to draw stems and leaves. That’s it! 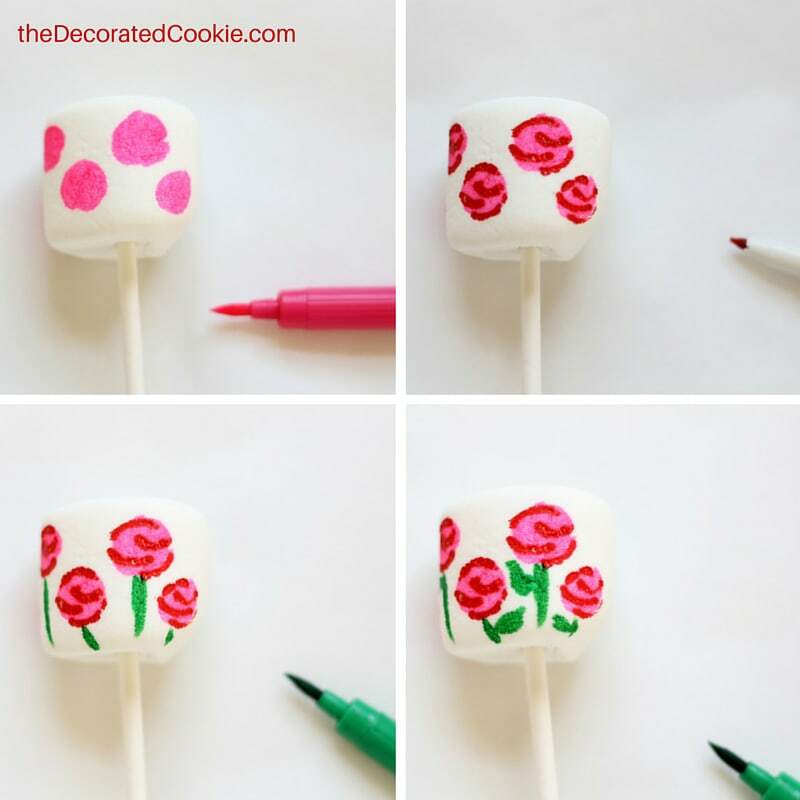 Great craft work you have done on these valentine special lollipop sticks.I am sure that your loved one will sure like these. 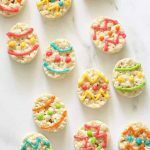 I made these and they turned out so pretty ! 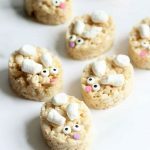 My kids enjoyed them and gobbled them up! I also made these without the sticks. What I did was dipped the bottoms into green melting chocolate and the tops I use pink melting chocolate and swirled it on top of the marshmallows. 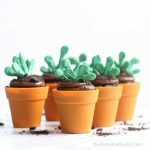 I placed them in mini cupcake liners for a pretty presentation for a Valentine’s Day party ! 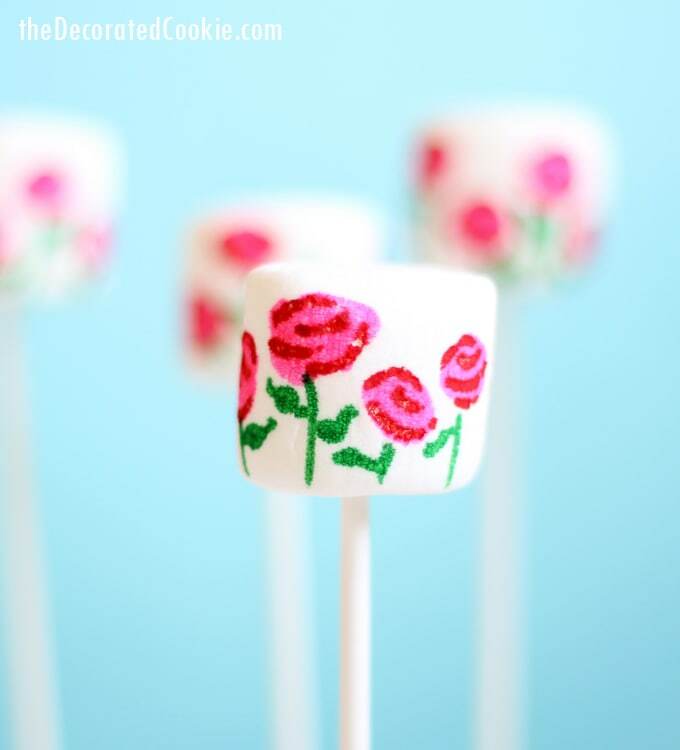 I also decorated a rose frosted cupcake with a rose garden marshmallow (- the stick ) and it turned out so pretty! Thanks for sharing and love the helpful video! Love love love it!! Mary!! I’m so glad it worked. Phew. And thank you so much for letting me know! !